INTERVIEW: Siya talks growing up in Bed-Stuy, being a gay woman in the rap industry, Tank's mentorship, and her debut album "SIYAvsSIYA." That Siya is perhaps better known for her role on the Oxygen reality show 'Sisterhood of Hip Hop' than her music is indicative of the struggle woman rappers face to earn industry-wide recognition and respect. Raised in Brooklyn's Eleanor Roosevelt housing projects, Siya attempts to prove her versatility on her new debut album SIYAvsSIYA, which is comprised of two parts. In the first, she adapts her classical NYC "Bed-Stuy Bully" persona before putting incorporating textured electronic instrumentals on the more melodic second half. 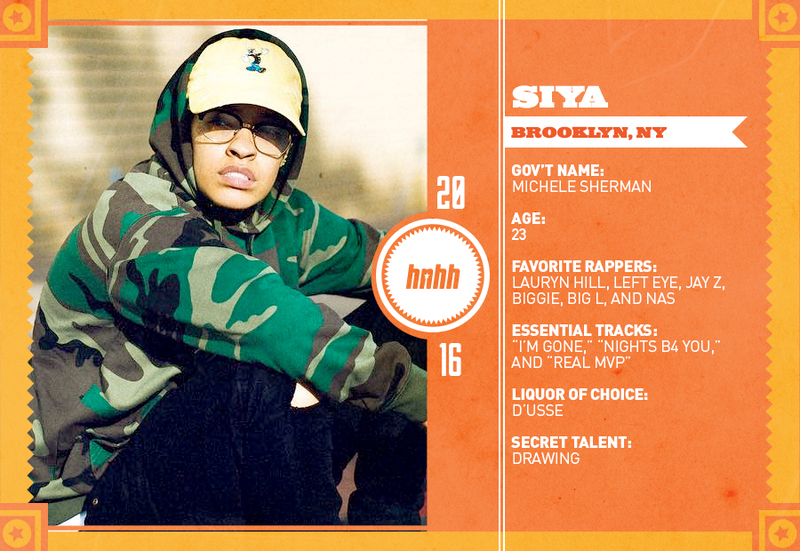 Siya recently spoke to HNHH about growing up in Bed-Stuy, being a gay woman in the rap industry, Tank's mentorship, and the concept behind SIYAvsSIYA. When did you first pick up the pen? I started rapping when I was 7. I got into Bone Thugs-N-Harmony when I first saw “Crossroads” and I fell in love with them and their styles of rhyming. I was always a huge fan of them, a huge fan of Bizzy Bone, and I used to wear my hair like them. The first song I ever made was in elementary school. I took Dru Hill’s “Sleeping In My Bed” and called it “Cheating On My Test” for a talent show at PS81 in Bed-Stuy, Brooklyn. I was a tomboy growing up, always around the boys in the projects, always up to no good. Bed-Stuy is closely associated with hip hop. What is one thing about Bed-Stuy that people don’t know, but should? Do you still live there? How gentrified Bed-Stuy has become. When I was growing up, Bed-Stuy was one of the worst neighborhoods in Brooklyn, especially my projects. But now, it’s totally different; it’s hipster, with new restaurants and clothing stores popping up. Now you see white people driving through the projects I grew up in, walking their dogs. At one point, somebody tried to buy the projects; my grandmother still resides there. She will never leave the projects; that’s her home. It’s not a threat now, but at first it was a little bit of a shock. I spend time in both Bed-Stuy and California. 'Sisterhood of Hip Hop' has had a successful run. If you had to pick one, what would be your favorite moment from the show? My favorite moment was when they flew my mother out in Season 2 to spend my birthday with me. That was the first time I spent a birthday with her in 20 years. It was cool that they captured the moment on television. I enjoyed the scene with you and your grandmother ordering a pack of Newport 100s and a pint of liquor. How often do you see your grandmother? How does she inspire you? I try to see her as often as possible. She’s just an overall strong black woman; she stepped up when my parents weren’t able to because of my mother’s drug addiction and my father being in prison. I definitely learned a lot from her. What’s harder in the rap industry -- being gay or being a woman? Being a woman is harder in the music industry. I don’t think being gay or my sexuality has affected me anymore. People are more open to it. But in such a male-dominated industry women have to prove that they can hold their own, bar for bar. Why did you title your album 'SIYAvsSIYA'? In what ways do you feel like you are going up against yourself? I wanted to show the versatility I have musically. I wanted to be able to give the fans both sides of me: singing, rapping, doing lyrical music, keeping it street… just giving everyone what they deserve. But also, I wanted to show that I am my only competition. I’m a firm believer in you becoming your worst enemy over time. I think everyday as human beings we wake up with a chip on our shoulders someway somehow, trying to overcome the struggles that we’re going through. I’m definitely continuing to grow and learn day by day. It’s an endless evolution of who I am. How did you originally connect with Tank? I had a meeting with some janky dudes in California who wanted to work, and Tank worked out of the same studio as them. The situation with those guys fell through, but when I got there, Tank was just showing me so much love and praising me. I went back to New York and a few months later I received a DM from him on Twitter asking if I wanted to come back to California to work with him. I jumped at the opportunity and I went for it. What role did he play on this album? What have you learned from working wit him? Tank runs the label that I’m signed to, R&B Money. When it comes to the album, he gives me free range to be who I am in the studio. He doesn’t try to hover over me or try to change anything about me or my music. Everything that I do or have done with SIYAvsSIYA is me being self-sufficient. I’m the one who picked out the tracks, I’m the one who wrote all the tracks, I recorded myself, and I mixed and mastered all of my own music. I actually wrote a record on Tank’s next album called “All On You,” so I’ve been dabbling in that as well. Working with Tank, I learned to be consistent. Getting up every day, even when it’s not supposed to be a day of recording, to just get up and get to the studio. Being an artist I feel like you should never take a day off, and I learned that work ethic partially from him. 2016 culminated in the release of your new album. What are your goals for 2017? We’re actually going to follow up SIYAvsSIYA with another EP called Commitment on Valentine’s Day. I’ve been shooting a lot of videos with this new director, Michael Garcia. He’s part of my team now. We’re going to start dropping videos back to back to back going into 2017. I also have a movie coming out via Flavor Unit that’s going straight to theaters. It’s called Deuces, and it’s me, Larenz Tate, Meagan Good, Rick Gonzalez, and Rotimi. That’s going to be amazing. And we’ll see about another season of 'Sisterhood of Hip-Hop,' Season 4. Many of your Instagram posts take the form of self-affirmations (“I am RESILIENT. I am FEARLESS,” etc.) Who are you speaking to with these affirmations? Do you see yourself as a role model? I’m speaking to the youth and to my culture, how I was raised. Young black kids and young Latinos don’t really have many role models and I try to be that for them. For people who look like me, think like me, act like me, I want to give them something to look up to. I want them to understand that the only person who can stop you is you. I’ve been told that I’m a role model both by kids and by adults, by people who know my story and know where I’ve come from and what I’ve done so far. I don’t feel any pressure to live up to any expectations. I just have to wake up everyday and continue to be myself the best way I can be. I have to be myself first before I can be anything else for anyone else.